вЂњStart the engine and turn OFF the ignition switch after warm-up.вЂќ This is defined as 1 trip. When initial malfunction is detected, TCM memorizes DTC. In these diagnoses, some illuminate MIL and some do not. Refer to TM-126, "DTC Index". When initial malfunction is detected, TCM memorizes DTC of the 1st trip. MIL does not light at this stage. <1 trip> If the same malfunction is detected again in next driving, TCM memorizes DTC. When DTC is memorized, MIL lights. <2 trip> вЂњTripвЂќ of the вЂњ2 trip detection diagnosisвЂќ indicates the driving mode that executes self-diagnosis during driving. The DTC number of the 1st trip is the same as the DTC number. When a malfunction is detected at the 1st trip, TCM memorizes DTC of the 1st trip. MIL does not light at this stage. If the same malfunction is not detected at the 2nd trip (conforming to necessary driving conditions), DTC at the 1st trip is erased from TCM. If the same malfunction is detected at the 2nd trip, TCM memorizes DTC and MIL lights at the same time. For procedure to delete DTC and 1st trip DTC from TCM, refer to TM-108, "CONSULT Function". If DTC of the 1st trip is detected, it is necessary to check the cause according to the вЂњDiagnosis flowвЂќ. Refer to TM-139, "Work Flow". TCM not only detects DTC, but also sends the MIL signal to ECM through CAN communication. ECM sends the MIL signal to the combination meter through CAN communication according to the signal, and illuminates MIL. For malfunction indicator lamp (MIL) description, refer to EC-63, "DIAGNOSIS DESCRIPTION : Malfunction Indicator Lamp (MIL)". When initial malfunction is detected, TCM memorizes DTC of the 1st trip. MIL does not light at this stage. If the same malfunction is detected at the 2nd trip, TCM memorizes DTC and MIL lights at the same time. Then, MIL goes after driving the vehicle for 3 trips under вЂњDriving condition BвЂќ without malfunction. DTC is displayed until 40 trips of вЂњDriving condition AвЂќ are satisfied without detecting the same malfunction. DTC is erased when 40 trips are satisfied. When the self-diagnosis result is acceptable at the 2nd trip (conforming to driving condition B), DTC of the 1st trip is erased. Driving pattern A is the driving condition that provides warm-up. In specific, count-up is performed when all of the following conditions are satisfied. Engine speed is 400 rpm or more. After start of the engine, the water temperature increased by 20В°C (36В°F) or more. Water temperature was 70В°C (158В°F) or more. The ignition switch was changed from ON to OFF. If the same malfunction is detected regardless of the driving condition, reset the A counter. When the above is satisfied without detecting the same malfunction, count up the A counter. When MIL goes off due to the malfunction and the A counter reaches 40, the DTC is erased. Driving pattern B is the driving condition that performs all diagnoses once. In closed loop control, vehicle speed of 70 вЂ“ 120 km/h (43 вЂ“ 75 MPH) continued for 60 seconds or more. In closed loop control, vehicle speed of 30 вЂ“ 60 km/h (19 вЂ“ 37 MPH) continued for 10 seconds or more. In closed loop control, vehicle speed of 4 km/h (2 MPH) or less and idle determination ON continued for 12 seconds or more. After start of the engine, 22 minutes or more have passed. The condition that the vehicle speed is 10km/h (6 MPH) or more continued for 10 seconds or more in total. If the same malfunction is detected regardless of the driving condition, reset the B counter. When the above is satisfied without detecting the same malfunction, count up the B counter. When the B counter is counted once without detecting the same malfunction after TCM memorizes DTC of the 1st trip, DTC of the 1st trip is erased. 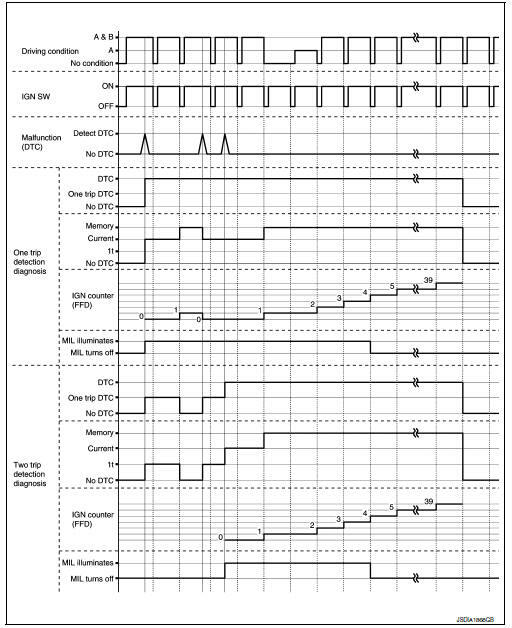 All DTC Reading Display all DTCs or diagnostic items that all ECUs are recording and judging. Work Support This mode enables a technician to adjust some devices faster and more accurately. Self Diagnostic Results Retrieve DTC from ECU and display diagnostic items. Data Monitor Monitor the input/output signal of the control unit in real time. CAN Diagnosis This mode displays a network diagnosis result about CAN by a diagram. 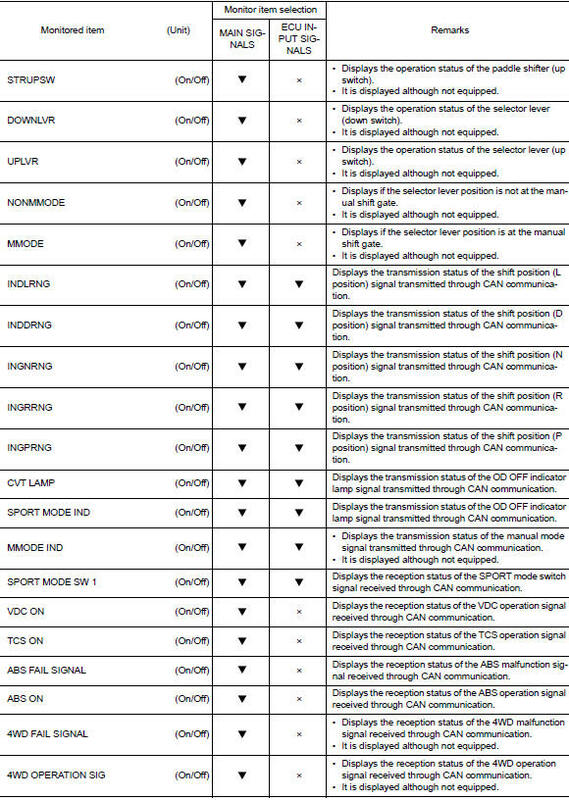 CAN Diagnosis Support Monitor It monitors the status of CAN communication. ECU Identification Display the ECU identification number (part number etc.) of the selected system. CALIB DATA The calibration data status of TCM can be checked. Refer to TM-126, "DTC Index". DTC (P0705, P0711, P0720, etc.) 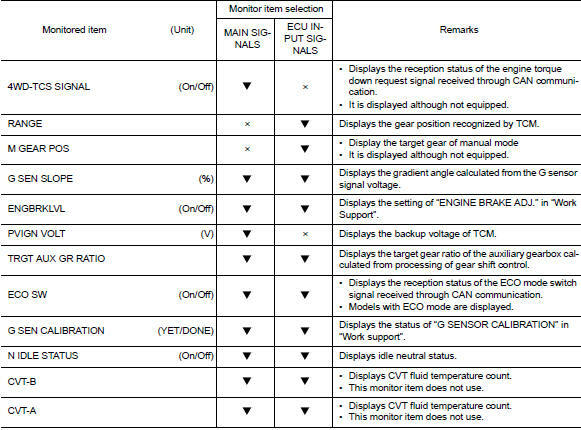 is specified by SAE J2012/ISO 15031-6. DTC and DTC at 1st trip are displayed on вЂњSelf Diagnostic resultsвЂќ of CONSULT. When DTC is currently detected, вЂњCRNTвЂќ is displayed. If вЂњPASTвЂќ is displayed, it shows a malfunction occurred in the past. The trip number of drive without malfunction of concerned DTC can be confirmed with вЂњIGN counterвЂќ inside вЂњFFDвЂќ. When the DTC at the 1st trip is detected, the вЂњtimingвЂќ is displayed as вЂњ1tвЂќ. If the ignition switch is left ON after repair, turn OFF the ignition switch and wait for 10 seconds or more. The ignition counter is displayed in вЂњFFDвЂќ and the number of times of satisfied вЂњDriving pattern AвЂќ is displayed after normal recovery of DTC. Refer to TM-106, "DIAGNOSIS DESCRIPTION : Counter System". If malfunction (DTC) is currently detected, вЂњ0вЂќ is displayed. After normal recovery, every time вЂњDriving pattern AвЂќ is satisfied, the display value increases from 1 → 2 → 3...38 → 39. When MIL turns OFF due to the malfunction and the counter reaches 40, the DTC is erased. The counter display of вЂњ40вЂќ cannot be checked. ENGINE BRAKE ADJ. 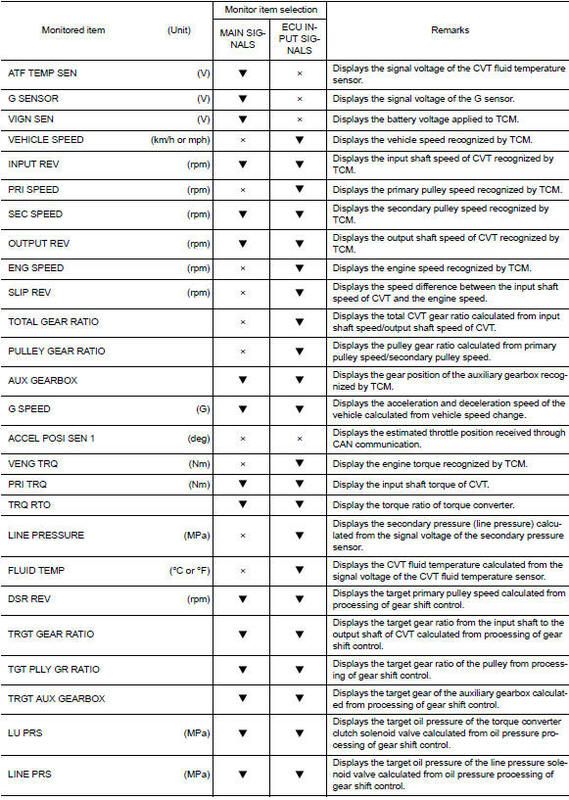 Although there is no malfunction on the transaxle and the CVT system, if a customer make a complaint like вЂњI do not feel comfortable with automatic operation of the engine brake on downhillвЂќ, the engine brake may be cancelled with вЂњengine brake adjustmentвЂќ. 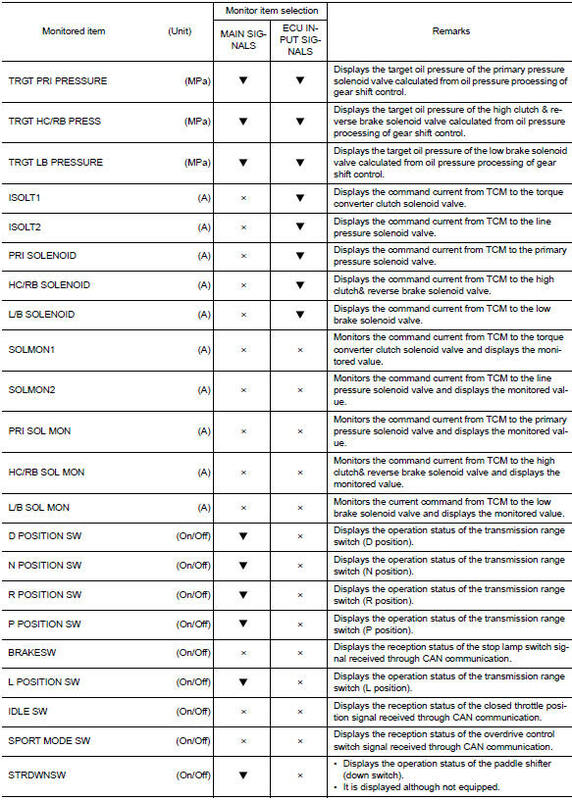 CONFORM CVTF DETERIORTN Check the degradation level of the CVT fluid under severe conditions. G SENSOR CALIBRATION Compensate the G sensor. ERASE CALIBRATION DATA Erase the calibration data memorized by TCM. ERASE LEARNING VALUE Erase the learning value memorized by TCM. ERASE MEMORY DATA Perform вЂњerasing of the calibration dataвЂќ and вЂњerasing of the learned valueвЂќ at the same time. ON : Turn ON the engine brake control. OFF : Turn OFF the engine brake control. Check the degradation level of the CVT fluid. 210,000 or more : Replacement of the CVT fluid is required. Less than 210,000 : Replacement of the CVT fluid is not required.